The Grammys averaged 19.9 million viewers, per Nielsen data, which actually represents a slight uptick compared to last year. The audience among adults age 18-49 — the key demographic on which ad sales are based — did slip about 7% below year-ago levels, to an all-time low. Since then, the Academy of Motion Picture Arts and Sciences (which presents the Oscars) and ABC have experienced a semi-public panic attack over how to arrest that decline, resulting in the mystery leading up to this year’s host-free telecast. The Recording Academy has faced similar pressures, if not quite as ostentatiously, before delivering a mostly entertaining show — with an expanded list of nominees in key categories — emceed by Alicia Keys, after two years of CBS latenight host James Corden. Notably, some of the proposed “fixes” for Oscar ratings didn’t seem to be a major issue for the Grammys. For starters, ABC has been eager to trim the broadcast’s length, holding it close to three hours. The Grammys ran several minutes past their allotted 3 ½-hour window, despite abruptly cutting Drake’s acceptance speech short and playing off some of the more long-winded winners. 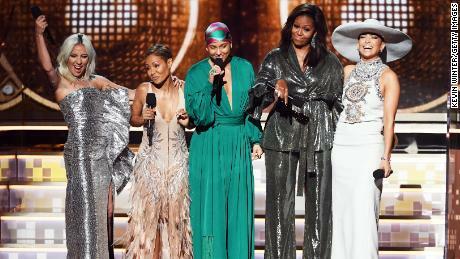 CBS did cite some other encouraging metrics, including the Grammys’ status as the “most social” awards telecast this season, and a significant increase on digital platforms. Overall, more than 40 million viewers watched at least part of the broadcast. The Oscars, of course, cap a dizzying run of award shows — many of them televised — that drag out over more than two months. Given that saturation and the sometimes-repetitive nature of these affairs — such as Lady Gaga singing “Shallow” on Sunday, and due to reprise that in two weeks on the Oscars — the top ceremonies seem to be fighting an ongoing battle to resist the pull of gravity. Still, Sunday’s Grammy results — paired with relatively flat numbers for the Golden Globes in January — provide some hope that audience tune-in could be flattening out, or at least settling around a new normal. The hope also lingers that having more popular nominees in the best-picture mix — including “Black Panther,” “Bohemian Rhapsody” and “A Star is Born” — will boost interest, and thus viewership.